Lunæ, 1 die Martii; Anno 11° Georgii IV ti Regis, 1830. House of Commons Certificate, presented. Account of Sovereigns, presented. No. 83. Return from the Court of Chancery, presented. Cork City Election-Report respecting the Absence of Mr. Russell. Mr. Russell to attend in his place. Berwick Light Dues Petition, reported. St. Katharine Dock Bill, committed. Brunswick-Square (Brighton) Improvement Bill, committed. Cowfold and Henfield Roads Bill, presented. Petition against Application for Stockport Junction Railway. Hull and Hedon Road Bill, presented. Neroche Forest Inclosure Bill, presented. Newcastle and North Shields Road Petition, reported. Petition against Worcester Suburbs Improvement Bill. Petitions against Importation of Foreign Wool. Address for Retura of Equity Suits in Wales and Chester. Petition for reduction of Duties on Sugar and Rum. Report of Revenue Inquiry, ordered. Miscellaneous Estimates, presented: Nos. 85, 86, 87, 88 & 89. Public Buildings. Churches in the West Indies. Howth, &c. Roads and Harbours. Officers of Lords and Commons. Expenses of Lords and Commons. Expenses of Slave Trade Commissions. Bills from New South Wales. Common Law and Real Property Commissions. Engineer Department, New South Wales. Accounts to be re-printed. No. 84. Petition for removal of Colonial Disabilities in the Island of Grenada. Petition for exempting Roman Catholics from Payment of Protestant Church Rates. Petition respecting the Estates of the Corporation-of Drogheda. Addresses respecting Court of Session. Petition respecting the Crown Property at Newark. Account of Surplus Ways and Means, referred. County Palatine of Durham Bill, passed. Report of Property in Infants, &c. Bill, considered. Report of Lunatics Property Bill, considered. Report of Liability of Real Property Bill, considered. Report of Contempt in Equity Bill, considered. Defaulters Names on Ballot, reported. Committee on Paupers Removal Bill. Report Supply (19 February) deferred. Deserted Children (Ireland) Bill, ordered. Return of Bankruptcy Commissioners, ordered. Whitesheet Hill Road Bill, reported. THE House being informed that Mr. Phillips, from the Commissioners for establishing Regulations in the Offices of the House of Commons, attended at the door, he was called in; and at the bar presented to the House, pursuant to the directions of an Act of Parliament,-Certificate of the Commissioners appointed by an Act passed in the 52d year of the reign of his late Majesty King George the Third, intituled, "An Act to repeal an Act passed in the 39th and 40th year of the reign of his present Majesty, for establishing Regulations in the Offices of the House of Commons, and to establish other and further Regulations in the said Offices:"-And then he withdrew. Mr. Chancellor of the Exchequer reported to the House, That their several Addresses of the 16th, 17th, 18th, 19th, 26th and 27th days of February last, (that His Majesty would be graciously pleased to give directions, that the Papers therein mentioned might be laid before this House,) had been presented to His Majesty; and that His Majesty had commanded him to acquaint this House, That He will give directions accordingly. The House being informed that Mr. Goodwin, from the office of His Majesty's Mint, attended at the door, he was called in; and at the bar presented to the House, pursuant to their Address to His Majesty,-An Account of all Sovereigns and Half Sovereigns coined at the Mint for persons other than the Bank of England, from the 1st January 1821 to the 31st July 1824; from the 1st August 1824 to the 31st December 1825; and from the 1st January 1826 to the 1st May 1828:-And then he withdrew. The House being informed, that Mr. Renard, from the office of the Accountant General of the High Court of Chancery, attended at the door, he was called in; and at the bar presented to the House,-Return to an Order of the House, dated the 9th day of February last, for a Return of the total amount of the Effects of the Suitors in the High Court of Chancery, in the years 1819, 1820, 1821, 1822, 1823, 1824, 1825, 1826, 1827, 1828 and 1829:- And then he withdrew. Sir Thomas Baring, from the Select Committee appointed to try and determine the merits of the Petition of Francis Lyons and others, Electors of the City of Cork, complaining of an undue Election and Return for the said City, informed the House, That the Committee met this morning at eleven o'clock, pursuant to their adjournment of Saturday last, and William Russell, Esquire, one of the Members of the Committee not attending, the Committee continued to sit for one hour, and then adjourned till Tomorrow morning at eleven of the clock. Ordered, That William Russell, Esquire, do attend this House in his place To-morrow. Mr. Beresford reported from the Committee on the Petition of several Owners of ships and other vessels, and Merchants and others, interested in the trade and shipping of the harbour of Berwick-upon-Tweed; That they had examined the matter thereof; and the Report was brought up, and read. Ordered, That leave be given to bring in a Bill for altering two Acts, passed in the 46th and 54th years of his late Majesty's reign, relating to the Northern Lighthouses: And that Mr. Beresford and Sir Francis Blake do prepare, and bring it in. Ordered, That Mr. Speaker do issue his Warrant to the Clerk of the Crown, to make out a new Writ for the electing of a Burgess to serve in this present Parliament for the Borough of Gatton, in the room of the Honourable William Scott, who, since his Election for the said Borough, hath accepted the office of Steward or Bailiff of His Majesty's three Chiltern Hundreds of Stoke, Desborough and Bonenham, in the County of Buckingham. 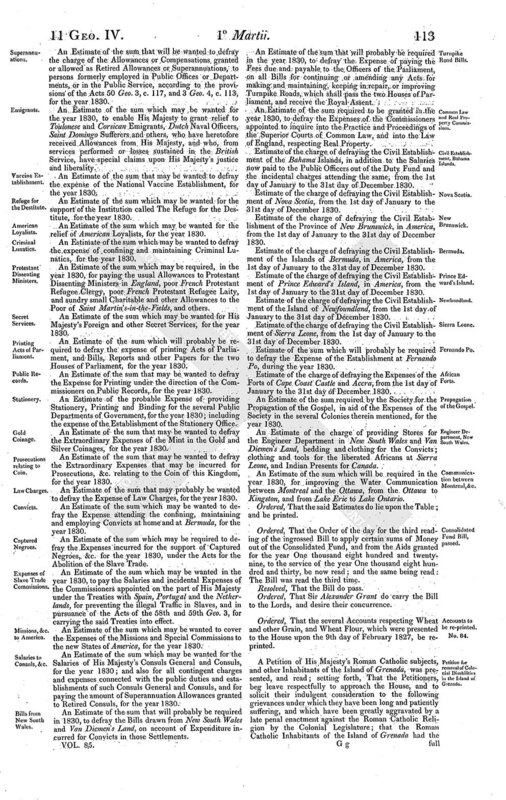 Sir Edward Knatchbull presented a Bill to amend an Act of the seventh year of His present Majesty, for more effectually draining and preserving certain Marsh Lands or Low Grounds in the Parishes of Sandhurst, Newenden, Rolvenden, Tenterden, Wittersham, Ebony, Woodchurch, Appledore and Stone, in the County of Kent, and Ticehurst, Salehurst, Bodiam, Ewhurst, Northiam, Beckly, Peasmarsh, Iden and Playden, in the County of Sussex: And the same was read the first time; and ordered to be read a second time. 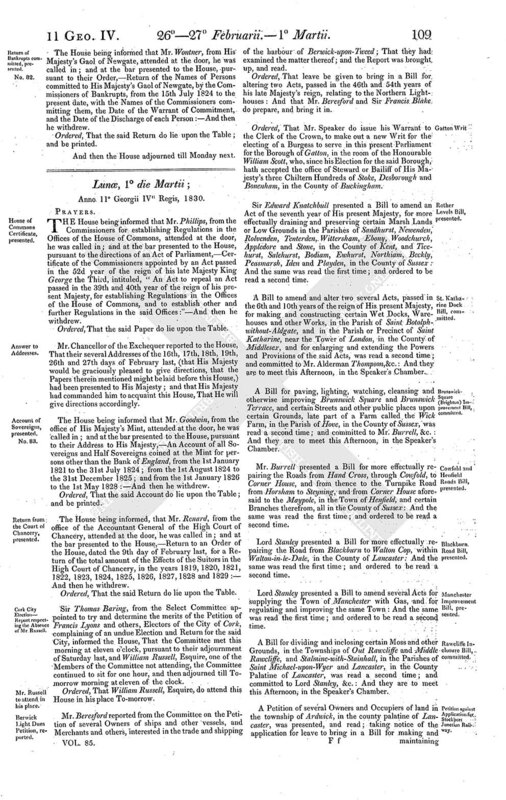 A Bill to amend and alter two several Acts, passed in the 6th and 10th years of the reign of His present Majesty, for making and constructing certain Wet Docks, Warehouses and other Works, in the Parish of Saint Botolphwithout-Aldgate, and in the Parish or Precinct of Saint Katharine, near the Tower of London, in the County of Middlesex, and for enlarging and extending the Powers and Provisions of the said Acts, was read a second time; and committed to Mr. Alderman Thompson, &c.: And they are to meet this Afternoon, in the Speaker's Chamber. A Bill for paving, lighting, watching, cleansing and otherwise improving Brunswick Square and Brunswick Terrace, and certain Streets and other public places upon certain Grounds, late part of a Farm called the Wick Farm, in the Parish of Hove, in the County of Sussex, was read a second time; and committed to Mr. Burrell, &c.: And they are to meet this Afternoon, in the Speaker's Chamber. Mr. Burrell presented a Bill for more effectually repairing the Roads from Hand Cross, through Cowfold, to Corner House, and from thence to the Turnpike Road from Horsham to Steyning, and from Corner House aforesaid to the Maypole, in the Town of Henfield, and certain Branches therefrom, all in the County of Sussex: And the same was read the first time; and ordered to be read a second time. Lord Stanley presented a Bill for more effectually repairing the Road from Blackburn to Walton Cop, within Walton-in-le-Dale, in the County of Lancaster: And the same was read the first time; and ordered to be read a second time. 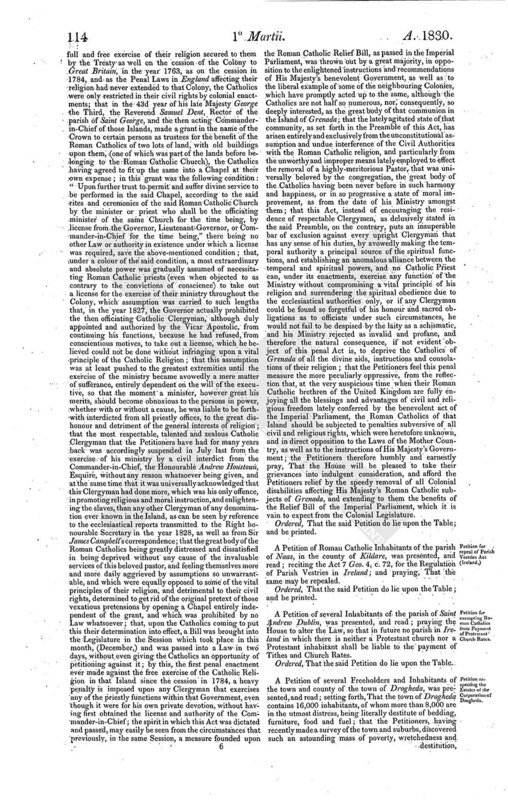 Lord Stanley presented a Bill to amend several Acts for supplying the Town of Manchester with Gas, and for regulating and improving the same Town: And the same was read the first time; and ordered to be read a second time. A Bill for dividing and inclosing certain Moss and other Grounds, in the Townships of Out Rawcliffe and Middle Rawcliffe, and Stalmine-with-Stainhall, in the Parishes of Saint Michael-upon-Wyer and Lancaster, in the County Palatine of Lancaster, was read a second time; and committed to Lord Stanley, &c.: And they are to meet this Afternoon, in the Speaker's Chamber. A Petition of several Owners and Occupiers of land in the township of Ardwick, in the county palatine of Lancaster, was presented, and read; taking notice of the application for leave to bring in a Bill for making and maintaining a Railway or Tramroad from the Liverpool and Manchester Railway, in Manchester aforesaid, to the Cromford and High-Peak Railway, at or near Fernilee, and a Branch therefrom to or near Wormhill, in the county of Derby; and praying, That the same may not pass into a law, and that they may be heard by themselves, their counsel or gents, against the same. Mr. Trani reported from the Committee on the Petition of several Commissioners under the Acts for paving, cleansing, lighting, watching and improving the Town of Dovor, in the County of Kent; That the Standing Orders relative to Bills for improving any City or Town, had been complied with; and that they had examined the matter of the Petition; and the Report was brought up, and read. Ordered, That leave be given to bring in a Bill to amend two Acts of his late Majesty, for paving, cleansing, lighting and watching the Town of Dovor, and for removing and preventing Nuisances and Annoyances therein: And that Mr. Trant and Mr. Poulett Thomson do prepare, and bring it in. Mr. Jones presented a Bill for more effectually maintaining and repairing several Roads from Carmarthen to Lampeterpontstephen, so far as relates to the Carmarthen District of Roads, and certain other Roads in the said County of Carmarthen: And the same was read the first time; and ordered to be read a second time. Mr. Jones presented a Bill for better lighting with Gas the Town of Swansea, in the County of Glamorgan: And the same was read the first time; and ordered to be read a second time. Sir Thomas Acland, by Order, presented a Bill for making and maintaining a new Turnpike Road from the Town of Kingston-upon-Hull, in the County of the said Town, to Hedon, in the County of York: And the same was read the first time; and ordered to be read a second time. Sir Thomas Acland presented a Bill for maintaining and governing the Harbour of Axmouth, and Works connected therewith, in the Parish of Axmouth, in the County of Devon: And the same was read the first time; and ordered to be read a second time. Sir Thomas Lethbridge presented a Bill for inclosing the Forest of Roach otherwise Roche otherwise Neroach otherwise Neroche, in the Parishes of Broadway, Bickenhall, Beercrocombe, Ilton, Barrington, Ashill, Illminster, Whitelackington, Curland, Donyatt, Isle-Abbotts, Hatchbeauchamp, and the Tithing of Domett, in the Parish of Buckland Saint Mary, or some or one of them, in the County of Somerset: And the same was read the first time; and ordered to be read a second time. Sir Thomas Lethbridge reported from the Committee on the Petition of the President and Governors of the Hospital or Infirmary at Bath; That the Standing Orders relative to Bills for supplying any City, Town or Place with Water, had been complied with; and that they had examined the matter of the Petition; and the Report was brought up, and read. Ordered, That leave be given to bring in a Bill for altering and amending an Act passed in the twelfth year of the reign of his Majesty King George the Second, for establishing and well-governing an Hospital or Infirmary in the City of Bath; and for constructing Baths therein, and supplying the same with Water from the Hot Baths in the said City: And that Sir Thomas Lethbridge and Mr. Dickinson do prepare, and bring it in. 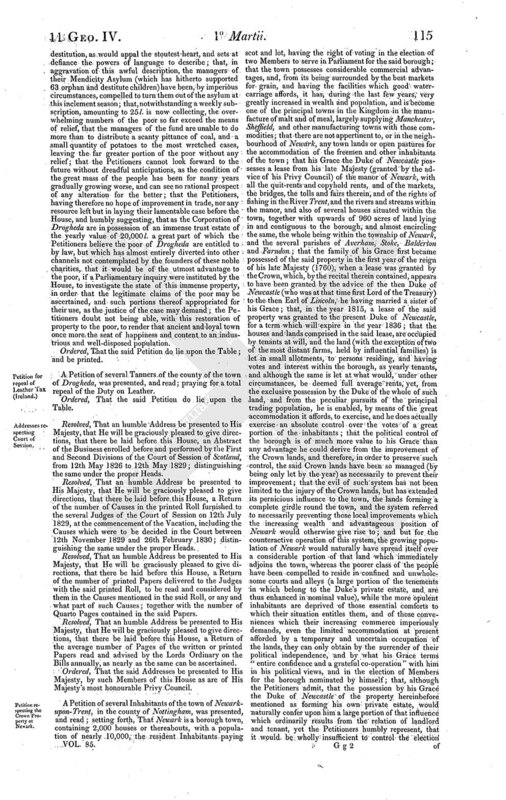 An ingrossed Bill to enlarge the Term and Powers of an Act for more effectually improving the Roads to and from the Town of Great Torrington, in the County of Devon, was read the third time. Mr. Charles Pallmer presented a Bill for amending and extending the provisions of an Act passed in the sixth year of the reign of His present Majesty, for the rebuilding of Kingston Bridge, and for improving and making suitable Approaches thereto: And the same was read the first time; and ordered to be read a second time. Mr. Stanley presented a Bill for making and maintaining a Railway from the Borough of Wigan to the Liverpool and Manchester Railway, in the Borough of Newton, in the County Palatine of Lancaster, and collateral Branches to communicate therewith: And the same was read the first time; and ordered to be read a second time. Mr. Bell reported from the Committee on the Petition of several Gentlemen, Merchants, Traders and others, residing in the towns of Newcastle-upon-Tyne and North Shields; That the Standing Orders relative to Turnpike Bills, had been complied with, except with respect to the last or thirdly mentioned Branch of Road described in the Petition, as commencing at or near to a place called Percy Main High Row, and terminating at the west end of Droitwich-street in North Shields, it having since been found more expedient that it should not terminate at the west end of Droitwich-street, but, instead thereof, should have two terminations, one at or near the west end of Union-street in North Shields, and the other at or near the west end of the New Quay in North Shields, both in the same townships and parishes as the first above-mentioned termination; inasmuch as should that Branch terminate only as originally proposed, the inhabitants and persons resorting to the upper and lower parts of North Shields will not derive the same advantage therefrom as if the proposed two terminations were adopted, the town of North Shields being built on the north bank of the River Tyne, which is very steep and difficult of ascent; such alteration would also effect a more direct and convenient approach to the landing place for a new Ferry, now proceeding with, which Ferry, when completed, will open a better communication between the north and south banks of the River Tyne, for which an Act was obtained in the last Session of Parliament; but it appeared to the Committee, that, with respect to the proposed alteration, no Map or Plan, Book of Reference and Lists of Owners or Occupiers, were deposited with the respective Clerks of the Peace of the county of Northumberland, and the town and county of Newcastle-upon-Tyne, within the time limited by the Standing Orders, or deposited in the Private Bill Office, such alteration not having been contemplated until the month of December last; and it also appeared, that all the Owners and Occupiers of the property affected by the alteration, have assented thereto, save one tenant from year to year, who is neuter; and that they had examined the matter of the Petition, and the Report was brought up, and read. Sir John Wrottesley reported from the Committee on the Petition of several Inhabitants of the township of Wolverhampton, in the county of Stafford; That the Standing Orders relative to Bills for repairing Churches, had not been complied with; but it appeared to the Committee, that the original object of the application to Parliament was merely the vesting the Patronage of the Church, which had been already built, in an individual, in consideration of a sum of money to be given as an aid to the income of the minister; that on the 15th of January last, however, the expediency of having Evening Service performed in the Church was suggested by the Bishop of the Diocese for the accommodation of the lower classes of society; that, with a view to such Service, it will become necessary to light the Church; and that the general public Church Acts not providing for the lighting of Churches, it is requisite to obtain such a provision in the proposed Bill, and to authorize the imposing a rate for that purpose; and that they had examined the matter of the Petition; and the Report was brought up, and read. A Petition of several Freeholders and Inhabitants of the parish of Saint John, in Bedwardine, in the county of Worcester, was presented, and read; taking notice of the Bill for lighting, watching and regulating the Suburbs of the City of Worcester; and praying, That the same may not pass into a law as it now stands. An ingrossed Bill for repairing the Road from Wool Bridge to the Borough of Dorchester, in the county of Dorset, was read the third time. Ordered, That Mr. Bankes do carry the Bill to the Lords, and desire their concurrence. A Petition of the Chamber of Commerce and Manufactures of the city of Edinburgh;-of the Merchants House of Glasgow;-and, of Merchants, Bankers, Manufacturers and other Inhabitants of the city of Glasgow,-were presented, and read; praying, That at the earliest period allowed by law, such measures may be adopted as shall secure to all His Majesty's subjects in the United Kingdom a free trade to all the countries situated to the eastward of the Cape of Good Hope, and the liberty of proceeding to and residing in those countries, under such regulations as to the House may seem proper and consistent with the good government, tranquillity and safety of the British possessions in the East Indies. And the said Petitions were ordered to be referred to the Select Committee on the East India Company's Affairs. Ordered, That Mr. John Fane have leave of absence for a week, on urgent private business. Ordered, That Mr. Strutt have leave of absence for a fortnight, on account of ill health. Ordered, That Mr. Curteis have leave of absence for a month, on account of ill health. Ordered, That Mr. Lygon have leave of absence for ten days, on urgent private business. Ordered, That Mr. Walter Campbell have leave of absence for a month, on account of ill health. Ordered, That Mr. Lewis Hughes have leave of absence for a month, on account of ill heath. Ordered, That Lord Tullamoore have leave of absence for a month, on urgent private business. Ordered, That Mr. Robert Clive have leave of absence for a fortnight, on urgent private business. Ordered, That Lord James Townshend have leave of absence for a month, on account of ill health. Ordered, That Mr. Nicolson Calvert have leave of absence for a week, to attend the assizes. Ordered, That Sir Joseph Yorke have leave of absence for a fortnight, on account of ill health. Ordered, That Mr. John Wood have leave of absence for a month, to go the circuit. Ordered, That Lord Viscount Eastnor have leave of absence until Friday next, on urgent private business. 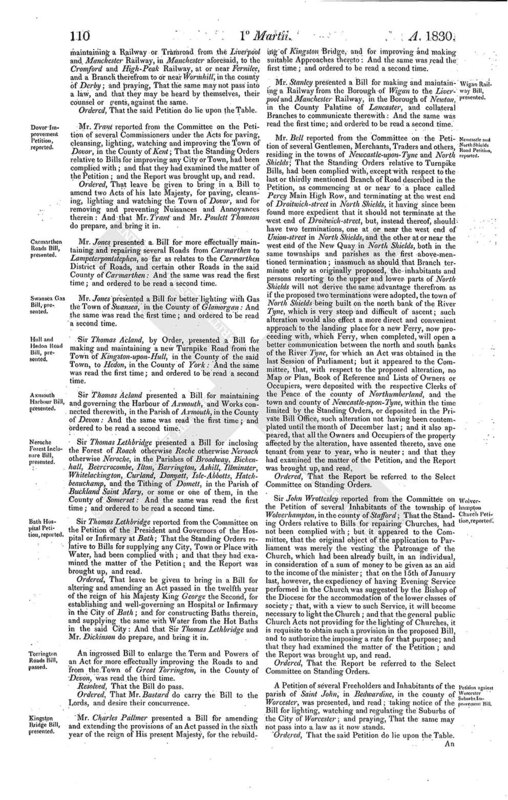 A Petition of several Proprietors and Occupiers of land and Inhabitants of the parishes of Etchingham and Salehurst;-of Clergy and Inhabitants of Bexhill, Hooe and Ninfield;-of several Inhabitants of Ash;-of Beaksbourn, Bishopsbourn, Patricksbourn and Bridge;- of Boughton, Hernehill, Goodnestone and Graveney;-of Sheldwich, Selling, Doddington, Wichling and Newnham;- of the city of Canterbury and its vicinity;-of Barming; -of Maidstone;-of Ashburnham, Penhurst and Catsfield, in the county of Sussex;-of Freeholders and Inhabitants of Shropshire;-and, of Owners, Occupiers of land, and Inhabitants in the hundred of Colneis and its neighbourhood, in the county of Suffolk,-were presented, and read; complaining of distress amongst the labouring and industrious classes; and praying the House that the tax on Malt and Beer may be totally repealed. And the said Petitions were ordered to lie upon the Table; and, except the two first, to be printed. A Petition of Occupiers of land in Romney Marsh and the adjoining Levels, and Growers of the staple commodity of this kingdom, wool;-and, of Gentry, Clergy, Owners and Occupiers of land, and Tradesmen in the town and neighbourhood of Louth, in the county of Lincoln,-were presented, and read; praying the House to afford the British wool-grower that protection from foreign competition which an excessive taxation justly entitles him to require. A Petition of the Chamber of Commerce for the Staffordshire Potteries, and of other Manufacturers resident therein;-of Shopkeepers and other Traders of Burslem, in the Staffordshire Potteries;-and, of Merchants, Manufacturers, Shopkeepers and other Inhabitants of Walsall, in the county of Stafford,-were presented, and read; setting forth, That the Petitioners have long felt the pernicious effects of the system of paying wages by truck or barter, instead of money; and praying the House for additional protection against a system which has hitherto defied the many Legislative Enactments which have been passed against it. A Motion was made, and the Question was proposed, That an humble Address be presented to His Majesty, that He will be graciously pleased to give directions, that there be laid before this House, a Return of all the Passports that have been granted to persons going abroad during the years 1826, 1827, 1828 and 1829; specifying the Number in each year, and the Countries for which each Passport was made out and registered:-And the said Motion was, with leave of the House, withdrawn. A Petition of Charles Hastings, m.d. President of the Worcestershire Medical and Surgical Society, was presented, and read; setting forth, That the said Society on the present, as on a former occasion, beg to state to the House, that they, in common with all other members and students of the different branches of the professions of Medicine and Surgery, are labouring under great hardships from the present state of the law, which, by impeding a most important branch of medical education, the practice of dissection, throws almost insurmountable difficulties in the way of acquiring a knowledge of Anatomy; the said Society further beg leave to state, that in consequence of the Petitions from the Physicians and Surgeons of many of the towns of this kingdom, a Committee of the House was appointed to inquire into the grievances complained of, from whose Report it appears that there are nearly one thousand students come to London annually for instruction in Medicine; to educate this number in the knowledge of Anatomy, the only legal means are the bodies of executed murderers, which scarcely amount to twelve annually throughout England; but the knowledge of Anatomy being indispensable to medical education, illegal means have naturally been adopted, and the Report before the House proves that most abominable methods have been practised by unprincipled ruffians to make up for this deficiency; it has been even proved that human beings have been murdered by the notorious Burke and Hare, to procure money for their bodies, which the law in its present state causes to be of high pecuniary value; there is every reason to believe that the enormities the said Society have mentioned form but a small part of what have really occurred, as the effect of the present state of the law upon the subject, and it must be evident that the increasing necessity for or diligent study of this branch of medical education will cause a still greater demand for dead bodies, and consequently increase the probability of the recurrence of such outrages, unless, instead of the present odious and disgusting system of disinterment, some plan more consistent with the sound principles of Legislation, and more agreeable to the practice successfully employed in other countries, be had recourse to; the said Society humbly call upon the members of the House, as senators and as men, to lose no time in maturing such a plan; it would be presumptuous in the said Society to endeavour to point out the nature of the restrictions under which dead bodies should be afforded to the schools of Anatomy, they may however remark upon a clause in a Bill lately under the consideration of the House, which made it imperative, that after dissection the funeral service should be read over the remains of the body; the said Society humbly submit, that it would be impossible for the anatomist to comply with such an injunction after the body has been dissected; the said Society also beg humbly to suggest, that in any Bill passed for the regulation of the study of Anatomy, provision should be made for the transfer of bodies to any part of the United Kingdom, as otherwise difficulties will still oppose themselves to the study of this important art in Edinburgh, Glasgow, and other places; the said Society beg also further to suggest, that in order to do away with the stigma that now attaches to dissection, the dead bodies of murderers be no longer given up to the anatomist as a part of the punishment for their crimes, since the said Society verily believe this practice has tended to increase the popular odium against dissection. Resolved, That an humble Address be presented to His Majesty, that He will be graciously pleased to give directions, that there be laid before this House, a Return of all Probates of Wills and Letters of Administration issued in such parts of the respective Dioceses of Saint David, Saint Asaph, Llandaff and Bangor as lie within the Principality of Wales; and specifying the amount of Assets respectively sworn on the same for the last five years. Resolved, That an humble Address be presented to His Majesty, that He will be graciously pleased to give directions, that there be laid before this House, a Return of all Processes issued, as the commencement of Suits in Equity, in each of the several Courts of Great Sessions in Wales, and in the Court of the Chamberlain of Chester, for the ten years last past; and a List of all Bills in Chancery filed in the same, for the same period. A Petition of several West India Planters and Merchants residing in the city of Bristol and its vicinity, was presented, and read; praying the House that such reduction may be made in the respective Duties on Sugar and Rum, or, as to the latter article, such modification as may not only afford to the Petitioners some substantial relief in their present unprecedented state of distress, but, as they believe, operate most beneficially in promoting the consumption of British manufactures in the West India Colonies, and increasing the comforts of the labouring classes of the British empire. Resolved, That an humble Address be presented to His Majesty, that He will be graciously pleased to give directions, that there be laid before this House, a Return of the number of Magistrates named in the Commission of the Peace in each County in Scotland; specifying the number who have qualified and acted as Magistrates, and stating the date of the last Commission, and addition thereto. Ordered, That there be laid before this House, a Copy of the Twenty-first Report of the Commissioners appointed to inquire into the Collection and Management of the Public Revenue arising in Ireland, and into certain Departments of the Public Revenue arising in Great Britain. Mr. Dawson presented to the House, by His Majesty's command,-An Estimate of the probable amount that will be required for Repairs, &c. of Public Buildings; for Furniture, &c. for the various Public Offices and Departments; and for certain Charges for lighting, watching, &c. defrayed by the Office of Works, for the year 1830. An Estimate of the sum that may be wanted in the present year, to defray the expense of sundry Works now executing at Port Patrick Harbour. An Estimate of the sum that may be wanted in the present year, to defray the expense of sundry Works now erecting at Donaghadee Harbour. An Estimate of the sum which may be required for carrying on the Works at the Royal Harbour of George the Fourth, at Kingstown (formerly Dunleary), for the year 1830. An Estimate of the sum that may probably be required in the year 1830, to defray the expense of the Alterations and Repairs at Windsor Castle. An Estimate of the sum required to be granted in the year 1830, in aid of the expense of erecting Churches in the West Indies. An Estimate of the amount that will be required to defray the expenditure to be incurred in 1830, in erecting and completing the Pier at Hobbs Point. An Estimate of the amount that will be required to defray the expense to be incurred during the year 1830, in erecting the State-Paper Office. An Estimate of the sum that may be wanted for the year 1830, on account of the Holyhead and Howth Roads and Harbour. An Estimate of the sum that will probably be required in the year 1830, for the New Buildings at the British Museum. An Estimate of the sum that may be wanted to defray the Salaries and Allowances to the Officers of the Houses of Lords and Commons, for the year 1830. An Estimate of the sum that may be wanted to defray the Expenses of the Houses of Lords and Commons, for the year 1830. An Estimate of the sum that may be wanted to make good the Deficiency of the Fee Fund in the department of His Majesty's Treasury, for the year 1830. An Estimate of the sum which may be wanted to make good the deficiency of the Fee Fund, in the department of His Majesty's Home Secretary of State, for the year 1830. An Estimate of the sum which may be wanted to make good the deficiency of the Fee Fund, in the department of His Majesty's Foreign Secretary of State, for the year 1830. An Estimate of the sum that may be wanted to make good the deficiency of the Fee Fund, in the department of His Majesty's Secretary of State for the Colonies, for the year 1830. An Estimate of the sum that may be wanted to make good the deficiency of the Fee Fund, in the departments of His Majesty's most honourable Privy Council, and the Committee of Privy Council for Trade, for the year 1830. An Estimate of the sum that may be wanted to defray the contingent Expenses and Messengers Bills, in the department of His Majesty's Treasury, for the year 1830. An Estimate of the sum that may be wanted to defray the contingent Expenses and Messengers Bills, in the department of His Majesty's Home Secretary of State, for the year 1830. An Estimate of the sum which may be wanted to defray the contingent Expenses and Messengers Bills in the department of His Majesty's Foreign Secretary of State, for the year 1830. An Estimate of the sum which may be wanted to defray the contingent Expenses and Messengers Bills in the department of His Majesty's Secretary of State for the Colonies for the year 1830. An Estimate of the sum which may be wanted to defray the contingent Expenses and Messengers Bills in the departments of His Majesty's most honourable Privy Council, and Committee of Privy Council for Trade, for the year 1830. An Estimate of the sum which may be wanted to make Compensation to the Commissioners appointed by the Acts 1 and 2 Geo. 4, c. 90, and 3 Geo. 4, c. 37, for inquiring into the collection and management of the Revenue in Ireland, and the several establishments connected therewith, and into certain other Revenue departments in Great Britain, for their assiduity, care and pains in the execution of the trust reposed in them by Parliament. An Estimate of the sum which may be wanted to defray the Salaries to certain Officers, and Expenses of the Court and Receipt of Exchequer, for the year 1830. An Estimate of the sum which may be wanted in the year 1830, to pay the Salaries or Allowances granted to certain Professors in the Universities of Oxford and Cambridge, for reading Courses of Lectures, for one year. An Estimate of the sum which may be wanted in the year 1830, for paying the Salaries of the Commissioners of the Insolvent Debtors Court, of their Clerks, and the contingent Expenses of their Office, for one year; and also, of the Expenses attendant upon the Circuits. An Estimate of the sum that may be wanted in the year 1830, for paying the Salaries of the Officers, and the contingent Expenses of the Office for the Superintendence of Aliens; and also, the Superannuation or Retired Allowances to Officers formerly employed in this service. An Estimate of the sum that will be wanted to defray the Expense of the Establishment of the Penitentiary House at Milbank, for the present year. An Estimate of the sum that will be wanted to defray the charge of the Allowances or Compensations granted or allowed as Retired Allowances or Superannuations, to persons formerly employed in Public Offices or Departments, or in the Public Service, according to the provisions of the Acts 50 Geo. 3, c. 117, and 3 Geo. 4, c. 113, for the year 1830. An Estimate of the sum which may be wanted for the year 1830, to enable His Majesty to grant relief to Toulonese and Corsican Emigrants, Dutch Naval Officers, Saint Domingo Sufferers and others, who have heretofore received Allowances from His Majesty, and who, from services performed or losses sustained in the British Service, have special claims upon His Majesty's justice and liberality. An Estimate of the sum that may be wanted to defray the expense of the National Vaccine Establishment, for the year 1830. An Estimate of the sum which may be wanted for the support of the Institution called The Refuge for the Destitute, for the year 1830. An Estimate of the sum which may be wanted for the relief of American Loyalists, for the year 1830. An Estimate of the sum which may be wanted to defray the expense of confining and maintaining Criminal Lunatics, for the year 1830. An Estimate of the sum which may be required, in the year 1830, for paying the usual Allowances to Protestant Dissenting Ministers in England, poor French Protestant Refugee Clergy, poor French Protestant Refugee Laity, and sundry small Charitable and other Allowances to the Poor of Saint Martin's-in-the-Fields, and others. An Estimate of the sum which may be wanted for His Majesty's Foreign and other Secret Services, for the year 1830. 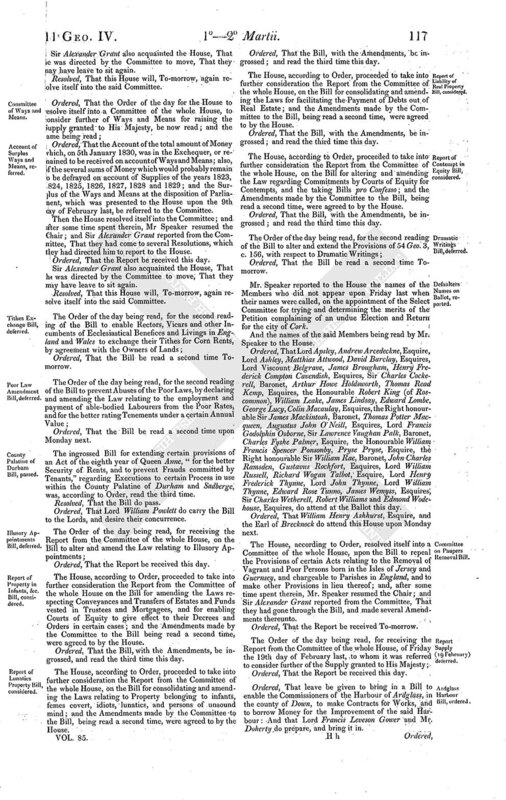 An Estimate of the sum which will probably be required to defray the expense of printing Acts of Parliament, and Bills, Reports and other Papers for the two Houses of Parliament, for the year 1830. An Estimate of the sum that may be wanted to defray the Expense for Printing under the direction of the Commissioners on Public Records, for the year 1830. An Estimate of the probable Expense of providing Stationery, Printing and Binding for the several Public Departments of Government, for the year 1830; including the expense of the Establishment of the Stationery Office. An Estimate of the sum that may be wanted to defray the Extraordinary Expenses of the Mint in the Gold and Silver Coinages, for the year 1830. An Estimate of the sum that may be wanted to defray the Extraordinary Expenses that may be incurred for Prosecutions, &c. relating to the Coin of this Kingdom, for the year 1830. An Estimate of the sum that may probably be wanted to defray the Expense of Law Charges, for the year 1830. An Estimate of the sum which may be wanted to defray the Expense attending the confining, maintaining and employing Convicts at home and at Bermuda, for the year 1830. An Estimate of the sum which may be required to defray the Expenses incurred for the support of Captured Negroes, &c. for the year 1830, under the Acts for the Abolition of the Slave Trade. An Estimate of the sum which may be wanted in the year 1830, to pay the Salaries and incidental Expenses of the Commissioners appointed on the part of His Majesty under the Treaties with Spain, Portugal and the Netherlands, for preventing the illegal Traffic in Slaves, and in pursuance of the Acts of the 58th and 59th Geo. 3, for carrying the said Treaties into effect. An Estimate of the sum which may be wanted to cover the Expenses of the Missions and Special Commissions to the new States of America, for the year 1830. An Estimate of the sum which may be wanted for the Salaries of His Majesty's Consuls General and Consuls, for the year 1830; and also for all contingent charges and expenses connected with the public duties and establishments of such Consuls General and Consuls, and for paying the amount of Superannuation Allowances granted to Retired Consuls, for the year 1830. An Estimate of the sum that will probably be required in 1830, to defray the Bills drawn from New South Wales and Van Diemen's Land, on account of Expenditure incurred for Convicts in those Settlements. An Estimate of the sum that will probably be required in the year 1830, to defray the Expense of paying the Fees due and payable to the Officers of the Parliament, on all Bills for continuing or amending any Acts for making and maintaining, keeping in repair, or improving Turnpike Roads, which shall pass the two Houses of Parliament, and receive the Royal Assent. An Estimate of the sum required to be granted in the year 1830, to defray the Expenses of the Commissioners appointed to inquire into the Practice and Proceedings of the Superior Courts of Common Law, and into the Law of England, respecting Real Property. Estimate of the charge of defraying the Civil Establishment of the Bahama Islands, in addition to the Salaries now paid to the Public Officers out of the Duty Fund and the incidental charges attending the same, from the 1st day of January to the 31st day of December 1830. Estimate of the charge of defraying the Civil Establishment of Nova Scotia, from the 1st day of January to the 31st day of December 1830. Estimate of the charge of defraying the Civil Establishment of the Province of New Brunswick, in America, from the 1st day of January to the 31st day of December 1830. Estimate of the charge of defraying the Civil Establishment of the Islands of Bermuda, in America, from the 1st day of January to the 31st day of December 1830. Estimate of the charge of defraying the Civil Establishment of Prince Edward's Island, in America, from the 1st day of January to the 31st day of December 1830. Estimate of the charge of defraying the Civil Establishment of the Island of Newfoundland, from the 1st day of January to the 31st day of December 1830. Estimate of the charge of defraying the Civil Establishment of Sierra Leone, from the 1st day of January to the 31st day of December 1830. Estimate of the sum which will probably be required to defray the Expense of the Establishment at Fernando Po, during the year 1830. Estimate of the charge of defraying the Expenses of the Forts of Cape Coast Castle and Accra, from the 1st day of January to the 31st day of December 1830. An Estimate of the sum required by the Society for the Propagation of the Gospel, in aid of the Expenses of the Society in the several Colonies therein mentioned, for the year 1830. An Estimate of the charge of providing Stores for the Engineer Department in New South Wales and Van Diemen's Land, bedding and clothing for the Convicts; clothing and tools for the liberated Africans at Sierra Leone, and Indian Presents for Canada. An Estimate of the sum which will be required in the year 1830, for improving the Water Communication between Montreal and the Ottawa, from the Ottawa to Kingston, and from Lake Erie to Lake Ontario. Ordered, That the Order of the day for the third reading of the ingrossed Bill to apply certain sums of Money out of the Consolidated Fund, and from the Aids granted for the year One thousand eight hundred and twentynine, to the service of the year One thousand eight hundred and thirty, be now read; and the same being read: The Bill was read the third time. Ordered, That the several Accounts respecting Wheat and other Grain, and Wheat Flour, which were presented to the House upon the 9th day of February 1827, be reprinted. 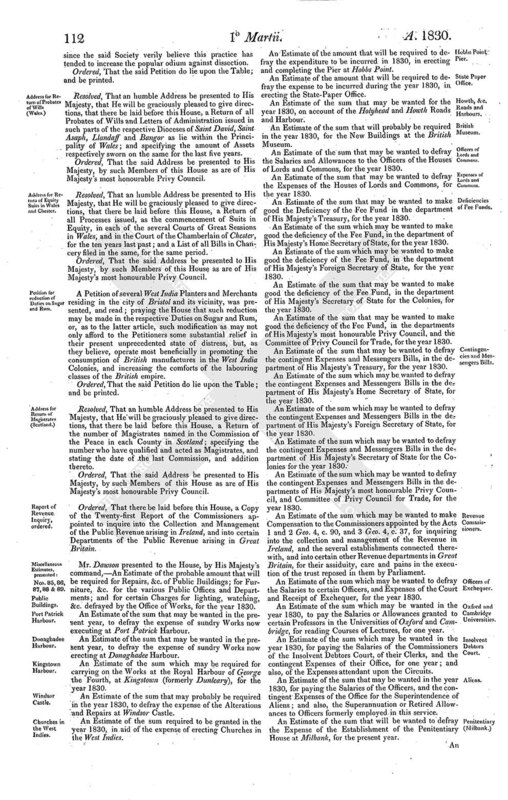 A Petition of His Majesty's Roman Catholic subjects, and other Inhabitants of the Island of Grenada, was presented, and read; setting forth, That the Petitioners, beg leave respectfully to approach the House, and to solicit their indulgent consideration to the following grievances under which they have been long and patiently suffering, and which have been greatly aggravated by a late penal enactment against the Roman Catholic Religion by the Colonial Legislature; that the Roman Catholic Inhabitants of the Island of Grenada had the full and free exercise of their religion secured to them by the Treaty as well on the cession of the Colony to Great Britain, in the year 1763, as on the cession in 1784, and as the Penal Laws in England affecting their religion had never extended to that Colony, the Catholics were only restricted in their civil rights by colonial enactments; that in the 43d year of his late Majesty George the Third, the Reverend Samuel Dent, Rector of the parish of Saint George, and the then acting Commanderin-Chief of those Islands, made a grant in the name of the Crown to certain persons as trustees for the benefit of the Roman Catholics of two lots of land, with old buildings upon them, (one of which was part of the lands before belonging to the Roman Catholic Church), the Catholics having agreed to fit up the same into a Chapel at their own expense; in this grant was the following condition: "Upon further trust to permit and suffer divine service to be performed in the said Chapel, according to the said rites and ceremonies of the said Roman Catholic Church by the minister or priest who shall be the officiating minister of the same Church for the time being, by license from the Governor, Lieutenant-Governor, or Commander-in-Chief for the time being," there being no other Law or authority in existence under which a license was required, save the above-mentioned condition; that, under a colour of the said condition, a most extraordinary and absolute power was gradually assumed of necessitating Roman Catholic priests (even when objected to as contrary to the convictions of conscience) to take out a license for the exercise of their ministry throughout the Colony, which assumption was carried to such lengths that, in the year 1827, the Governor actually prohibited the then officiating Catholic Clergyman, although duly appointed and authorized by the Vicar Apostolic, from continuing his functions, because he had refused, from conscientious motives, to take out a license, which he believed could not be done without infringing upon a vital principle of the Catholic Religion; that this assumption was at least pushed to the greatest extremities until the exercise of the ministry became avowedly a mere matter of sufferance, entirely dependent on the will of the executive, so that the moment a minister, however great his merits, should become obnoxious to the persons in power, whether with or without a cause, he was liable to be forthwith interdicted from all priestly offices, to the great dishonour and detriment of the general interests of religion; that the most respectable, talented and zealous Catholic Clergyman that the Petitioners have had for many years back was accordingly suspended in July last from the exercise of his ministry by a civil interdict from the Commander-in-Chief, the Honourable Andrew Houstoun, Esquire, without any reason whatsoever being given, and at the same time that it was universally acknowledged that this Clergyman had done more, which was his only offence, in promoting religious and moral instruction, and enlightening the slaves, than any other Clergyman of any denomination ever known in the Island, as can be seen by reference to the ecclesiastical reports transmitted to the Right honourable Secretary in the year 1828, as well as from Sir James Campbell's correspondence; that the great body of the Roman Catholics being greatly distressed and dissatisfied in being deprived without any cause of the invaluable services of this beloved pastor, and feeling themselves more and more daily aggrieved by assumptions so unwarrantable, and which were equally opposed to some of the vital principles of their religion, and detrimental to their civil rights, determined to get rid of the original pretext of those vexatious pretensions by opening a Chapel entirely independent of the grant, and which was prohibited by no Law whatsoever; that, upon the Catholics coming to put this their determination into effect, a Bill was brought into the Legislature in the Session which took place in this month, (December,) and was passed into a Law in two days, without even giving the Catholics an opportunity of petitioning against it; by this, the first penal enactment ever made against the free exercise of the Catholic Religion in that Island since the cession in 1784, a heavy penalty is imposed upon any Clergyman that exercises any of the priestly functions within that Government, even though it were for his own private devotion, without having first obtained the license and authority of the Commander-in-Chief; the spirit in which this Act was dictated and passed, may easily be seen from the circumstances that previously, in the same Session, a measure founded upon the Roman Catholic Relief Bill, as passed in the Imperial Parliament, was thrown out by a great majority, in opposition to the enlightened instructions and recommendations of His Majesty's benevolent Government, as well as to the liberal example of some of the neighbouring Colonies, which have promptly acted up to the same, although the Catholics are not half so numerous, nor, consequently, so deeply interested, as the great body of that communion in the Island of Grenada; that the lately agitated state of that community, as set forth in the Preamble of this Act, has arisen entirely and exclusively from the unconstitutional assumption and undue interference of the Civil Authorities with the Roman Catholic religion, and particularly from the unworthy and improper means lately employed to effect the removal of a highly-meritorious Pastor, that was universally beloved by the congregation, the great body of the Catholics having been never before in such harmony and happiness, or in so progressive a state of moral improvement, as from the date of his Ministry amongst them; that this Act, instead of encouraging the residence of respectable Clergymen, as delusively stated in the said Preamble, on the contrary, puts an insuperable bar of exclusion against every upright Clergyman that has any sense of his duties, by avowedly making the temporal authority a principal source of the spiritual functions, and establishing an anomalous alliance between the temporal and spiritual powers, and no Catholic Priest can, under its enactments, exercise any function of the Ministry without compromising a vital principle of his religion and surrendering the spiritual obedience due to the ecclesiastical authorities only, or if any Clergyman could be found so forgetful of his honour and sacred obligations as to officiate under such circumstances, he would not fail to be despised by the laity as a schismatic, and his Ministry rejected as invalid and profane, and therefore the natural consequence, if not evident object of this penal Act is, to deprive the Catholics of Grenada of all the divine aids, instructions and consolations of their religion; that the Petitioners feel this penal measure the more peculiarly oppressive, from the reflection that, at the very auspicious time when their Roman Catholic brethren of the United Kingdom are fully enjoying all the blessings and advantages of civil and religious freedom lately conferred by the benevolent act of the Imperial Parliament, the Roman Catholics of that Island should be subjected to penalties subversive of all civil and religious rights, which were heretofore unknown, and in direct opposition to the Laws of the Mother Country, as well as to the instructions of His Majesty's Government; the Petitioners therefore humbly and earnestly pray, That the House will be pleased to take their grievances into indulgent consideration, and afford the Petitioners relief by the speedy removal of all Colonial disabilities affecting His Majesty's Roman Catholic subjects of Grenada, and extending to them the benefits of the Relief Bill of the Imperial Parliament, which it is vain to expect from the Colonial Legislature. A Petition of Roman Catholic Inhabitants of the parish of Naas, in the county of Kildare, was presented, and read; reciting the Act 7 Geo. 4, c. 72, for the Regulation of Parish Vestries in Ireland; and praying, That the same may be repealed. 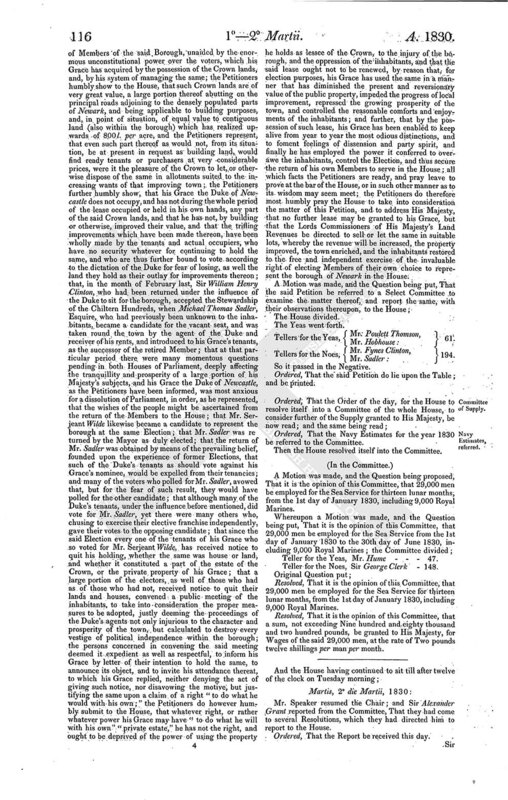 A Petition of several Inhabitants of the parish of Saint Andrew Dublin, was presented, and read; praying the House to alter the Law, so that in future no parish in Ireland in which there is neither a Protestant church nor a Protestant inhabitant shall be liable to the payment of Tithes and Church Rates. A Petition of several Freeholders and Inhabitants of the town and county of the town of Drogheda, was presented, and read; setting forth, That the town of Drogheda contains 16,000 inhabitants, of whom more than 8,000 are in the utmost distress, being literally destitute of bedding, furniture, food and fuel; that the Petitioners, having recently made a survey of the town and suburbs, discovered such an astounding mass of poverty, wretchedness and destitution, as would appal the stoutest heart, and sets at defiance the powers of language to describe; that, in aggravation of this awful description, the managers of their Mendicity Asylum (which has hitherto supported 63 orphan and destitute children) have been, by imperious circumstances, compelled to turn them out of the asylum at this inclement season; that, notwithstanding a weekly subscription, amounting to 25l. is now collecting, the overwhelming numbers of the poor so far exceed the means of relief, that the managers of the fund are unable to do more than to distribute a scanty pittance of coal, and a small quantity of potatoes to the most wretched cases, leaving the far greater portion of the poor without any relief; that the Petitioners cannot look forward to the future without dreadful anticipations, as the condition of the great mass of the people has been for many years gradually growing worse, and can see no rational prospect of any alteration for the better; that the Petitioners, having therefore no hope of improvement in trade, nor any resource left but in laying their lamentable case before the House, and humbly suggesting, that as the Corporation of Drogheda are in possession of an immense trust estate of the yearly value of 20,000l. a great part of which the Petitioners believe the poor of Drogheda are entitled to by law, but which has almost entirely diverted into other channels not contemplated by the founders of these noble charities, that it would be of the utmost advantage to the poor, if a Parliamentary inquiry were instituted by the House, to investigate the state of this immense property, in order that the legitimate claims of the poor may be ascertained, and such portions thereof appropriated for their use, as the justice of the case may demand; the Petitioners doubt not being able, with this restoration of property to the poor, to render that ancient and loyal town once more the seat of happiness and content to an industrious and well-disposed population. A Petition of several Tanners of the county of the town of Drogheda, was presented, and read; praying for a total repeal of the Duty on Leather. Resolved, That an humble Address be presented to His Majesty, that He will be graciously pleased to give directions, that there be laid before this House, an Abstract of the Business enrolled before and performed by the First and Second Divisions of the Court of Session of Scotland, from 12th May 1826 to 12th May 1829; distinguishing the same under the proper Heads. Resolved, That an humble Address be presented to His Majesty, that He will be graciously pleased to give directions, that there be laid before this House, a Return of the number of Causes in the printed Roll furnished to the several Judges of the Court of Session on 12th July 1829, at the commencement of the Vacation, including the Causes which were to be decided in the Court between 12th November 1829 and 26th February 1830; distinguishing the same under the proper Heads. Resolved, That an humble Address be presented to His Majesty, that He will be graciously pleased to give directions, that there be laid before this House, a Return of the number of printed Papers delivered to the Judges with the said printed Roll, to be read and considered by them in the Causes mentioned in the said Roll, or any and what part of such Causes; together with the number of Quarto Pages contained in the said Papers. Resolved, That an humble Address be presented to His Majesty, that He will be graciously pleased to give directions, that there be laid before this House, a Return of the average number of Pages of the written or printed Papers read and advised by the Lords Ordinary on the Bills annually, as nearly as the same can be ascertained. A Petition of several Inhabitants of the town of Newarkupon-Trent, in the county of Nottingham, was presented, and read; setting forth, That Newark is a borough town, containing 2,000 houses or thereabouts, with a population of nearly 10,000, the resident Inhabitants paying scot and lot, having the right of voting in the election of two Members to serve in Parliament for the said borough; that the town possesses considerable commercial advantages, and, from its being surrounded by the best markets for grain, and having the facilities which good watercarriage affords, it has, during the last few years, very greatly increased in wealth and population, and is become one of the principal towns in the Kingdom in the manufacture of malt and of meal, largely supplying Manchester, Sheffield, and other manufacturing towns with those commodities; that there are not appertinent to, or in the neighbourhood of Newark, any town lands or open pastures for the accommodation of the freemen and other inhabitants of the town; that his Grace the Duke of Newcastle possesses a lease from his late Majesty (granted by the advice of his Privy Council) of the manor of Newark, with all the quit-rents and copyhold rents, and of the markets, the bridges, the tolls and fairs therein, and of the rights of fishing in the River Trent, and the rivers and streams within the manor, and also of several houses situated within the town, together with upwards of 960 acres of land lying in and contiguous to the borough, and almost encircling the same, the whole being within the township of Newark, and the several parishes of Averham, Stoke, Balderton and Farndon; that the family of his Grace first became possessed of the said property in the first year of the reign of his late Majesty (1760), when a lease was granted by the Crown, which, by the recital therein contained, appears to have been granted by the advice of the then Duke of Newcastle (who was at that time first Lord of the Treasury) to the then Earl of Lincoln, he having married a sister of his Grace; that, in the year 1815, a lease of the said property was granted to the present Duke of Newcastle, for a term which will expire in the year 1836; that the houses and lands comprised in the said lease, are occupied by tenants at will, and the land (with the exception of two of the most distant farms, held by influential families) is let in small allotments, to persons residing, and having votes and interest within the borough, as yearly tenants, and although the same is let at what would, under other circumstances, be deemed full average rents, yet, from the exclusive possession by the Duke of the whole of such land, and from the peculiar pursuits of the principal trading population, he is enabled, by means of the great accommodation it affords, to exercise, and he does actually exercise an absolute control over the votes of a great portion of the inhabitants; that the political control of the borough is of much more value to his Grace than any advantage he could derive from the improvement of the Crown lands, and therefore, in order to preserve such control, the said Crown lands have been so managed (by being only let by the year) as necessarily to prevent their improvement; that the evil of such system has not been limited to the injury of the Crown lands, but has extended its pernicious influence to the town, the lands forming a complete girdle round the town, and the system referred to necessarily preventing those local improvements which the increasing wealth and advantageous position of Newark would otherwise give rise to; and but for the counteractive operation of this system, the growing population of Newark would naturally have spread itself over a considerable portion of that land which immediately adjoins the town, whereas the poorer class of the people have been compelled to reside in confined and unwholesome courts and alleys (a large portion of the tenements in which belong to the Duke's private estate, and are thus enhanced in nominal value), while the more opulent inhabitants are deprived of those essential comforts to which their situation entitles them, and of those conveniences which their increasing commerce imperiously demands, even the limited accommodation at present afforded by a temporary and uncertain occupation of the lands, they can only obtain by the surrender of their political independence, and by what his Grace terms "entire confidence and a grateful co-operation" with him in his political views, and in the election of Members for the borough nominated by himself; that, although the Petitioners admit, that the possession by his Grace the Duke of Newcastle of the property hereinbefore mentioned as forming his own private estate, would naturally confer upon him a large portion of that influence which ordinarily results from the relation of landlord and tenant, yet the Petitioners humbly represent, that it would be wholly insufficient to control the election of Members of the said Borough, unaided by the enormous unconstitutional power over the voters, which his Grace has acquired by the possession of the Crown lands, and, by his system of managing the same; the Petitioners humbly show to the House, that such Crown lands are of very great value, a large portion thereof abutting on the principal roads adjoining to the densely populated parts of Newark, and being applicable to building purposes, and, in point of situation, of equal value to contiguous land (also within the borough) which has realized upwards of 800l. per acre, and the Petitioners represent, that even such part thereof as would not, from its situation, be at present in request as building land, would find ready tenants or purchasers at very considerable prices, were it the pleasure of the Crown to let, or otherwise dispose of the same in allotments suited to the increasing wants of that improving town; the Petitioners further humbly show, that his Grace the Duke of Newcastle does not occupy, and has not during the whole period of the lease occupied or held in his own hands, any part of the said Crown lands, and that he has not, by building or otherwise, improved their value, and that the trifling improvements which have been made thereon, have been wholly made by the tenants and actual occupiers, who have no security whatever for continuing to hold the same, and who are thus further bound to vote according to the dictation of the Duke for fear of losing, as well the land they hold as their outlay for improvements thereon; that, in the month of February last, Sir William Henry Clinton, who had been returned under the influence of the Duke to sit for the borough, accepted the Stewardship of the Chiltern Hundreds, when Michael Thomas Sadler, Esquire, who had previously been unknown to the inhabitants, became a candidate for the vacant seat, and was taken round the town by the agent of the Duke and receiver of his rents, and introduced to his Grace's tenants, as the successor of the retired Member; that at that particular period there were many momentous questions pending in both Houses of Parliament, deeply affecting the tranquillity and prosperity of a large portion of his Majesty's subjects, and his Grace the Duke of Newcastle, as the Petitioners have been informed, was most anxious for a dissolution of Parliament, in order, as he represented, that the wishes of the people might be ascertained from the return of the Members to the House; that Mr. Serjeant Wilde likewise became a candidate to represent the borough at the same Election; that Mr. Sadler was re turned by the Mayor as duly elected; that the return of Mr. Sadler was obtained by means of the prevailing belief, founded upon the experience of former Elections, that such of the Duke's tenants as should vote against his Grace's nominee, would be expelled from their tenancies; and many of the voters who polled for Mr. Sadler, avowed that, but for the fear of such result, they would have polled for the other candidate; that although many of the Duke's tenants, under the influence before mentioned, did vote for Mr. Sadler, yet there were many others who, chusing to exercise their elective franchise independently, gave their votes to the opposing candidate; that since the said Election every one of the tenants of his Grace who so voted for Mr. Serjeant Wilde, has received notice to quit his holding, whether the same was house or land, and whether it constituted a part of the estate of the Crown, or the private property of his Grace; that a large portion of the electors, as well of those who had as of those who had not, received notice to quit their lands and houses, convened a public meeting of the inhabitants, to take into consideration the proper measures to be adopted, justly deeming the proceedings of the Duke's agents not only injurious to the character and prosperity of the town, but calculated to destroy every vestige of political independence within the borough; the persons concerned in convening the said meeting deemed it expedient as well as respectful, to inform his Grace by letter of their intention to hold the same, to announce its object, and to invite his attendance thereat, to which his Grace replied, neither denying the act of giving such notice, nor disavowing the motive, but justifying the same upon a claim of a right "to do what he would with his own;" the Petitioners do however humbly submit to the House, that whatever right, or rather whatever power his Grace may have "to do what he will with his own" "private estate," he has not the right, and ought to be deprived of the power of using the property he holds as lessee of the Crown, to the injury of the borough, and the oppression of the inhabitants, and that the said lease ought not to be renewed, by reason that, for election purposes, his Grace has used the same in a manner that has diminished the present and reversionary value of the public property, impeded the progress of local improvement, repressed the growing prosperity of the town, and controlled the reasonable comforts and enjoyments of the inhabitants; and further, that by the possession of such lease, his Grace has been enabled to keep alive from year to year the most odious distinctions, and to foment feelings of dissension and party spirit, and finally he has employed the power it conferred to overawe the inhabitants, control the Election, and thus secure the return of his own Members to serve in the House; all which facts the Petitioners are ready, and pray leave to prove at the bar of the House, or in such other manner as to its wisdom may seem meet; the Petitioners do therefore most humbly pray the House to take into consideration the matter of this Petition, and to address His Majesty, that no further lease may be granted to his Grace, but that the Lords Commissioners of His Majesty's Land Revenues be directed to sell or let the same in suitable lots, whereby the revenue will be increased, the property improved, the town enriched, and the inhabitants restored to the free and independent exercise of the invaluable right of electing Members of their own choice to represent the borough of Newark in the House. Tellers for the Yeas, Mr. Poulett Thomson, 61. Tellers for the Noes, Mr. Fynes Clinton, 194. Ordered, That the Navy Estimates for the year 1830 be referred to the Committee. A Motion was made, and the Question being proposed, That it is the opinion of this Committee, that 29,000 men be employed for the Sea Service for thirteen lunar months, from the 1st day of January 1830, including 9,000 Royal Marines. Teller for the Yeas, Mr. Hume - - - 47. Teller for the Noes, Sir George Clerk - 148. Resolved, That it is the opinion of this Committee, that 29,000 men be employed for the Sea Service for thirteen lunar months, from the 1st day of January 1830, including 9,000 Royal Marines. Resolved, That it is the opinion of this Committee, that a sum, not exceeding Nine hundred and eighty thousand and two hundred pounds, be granted to His Majesty, for Wages of the said 29,000 men, at the rate of Two pounds twelve shillings per man per month. Resolved, That this House will, To-morrow, again reolve itself into the said Committee. Ordered, That the Account of the total amount of Money which, on 5th January 1830, was in the Exchequer, or remained to be received on account of Ways and Means; also, of the several sums of Money which would probably remain to be defrayed on account of Supplies of the years 1823, 1824, 1825, 1826, 1827, 1828 and 1829; and the Surplus of the Ways and Means at the disposition of Parliament, which was presented to the House upon the 9th day of February last, be referred to the Committee. Then the House resolved itself into the Committee; and after some time spent therein, Mr Speaker resumed the Chair; and Sir Alexander Grant reported from the Committee, That they had come to several Resolutions, which they had directed him to report to the House. Ordered, That the Bill be read a second time Tomorrow. The ingrossed Bill for extending certain provisions of an Act of the eighth year of Queen Anne, "for the better Security of Rents, and to prevent Frauds committed by Tenants," regarding Executions to certain Process in use within the County Palatine of Durham and Sadberge, was, according to Order, read the third time. Ordered, That Lord William Powlett do carry the Bill to the Lords, and desire their concurrence. 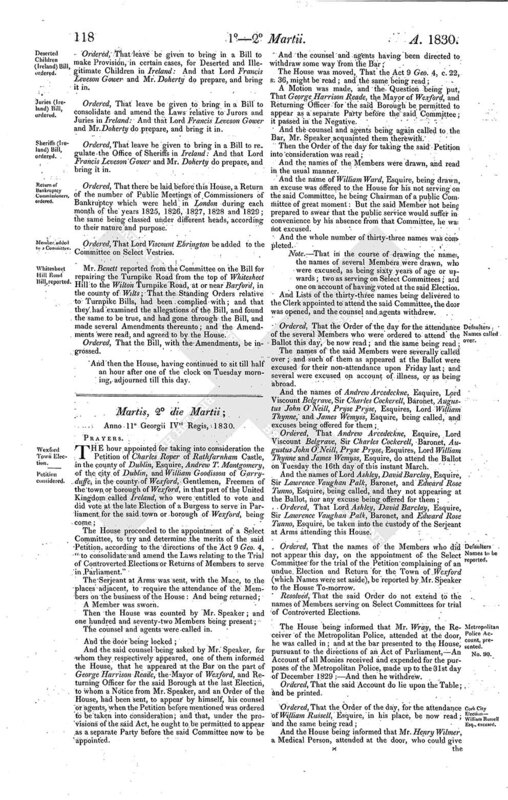 The House, according to Order, proceeded to take into further consideration the Report from the Committee of the whole House on the Bill for amending the Laws respecting Conveyances and Transfers of Estates and Funds vested in Trustees and Mortgagees, and for enabling Courts of Equity to give effect to their Decrees and Orders in certain cases; and the Amendments made by the Committee to the Bill being read a second time, were agreed to by the House. 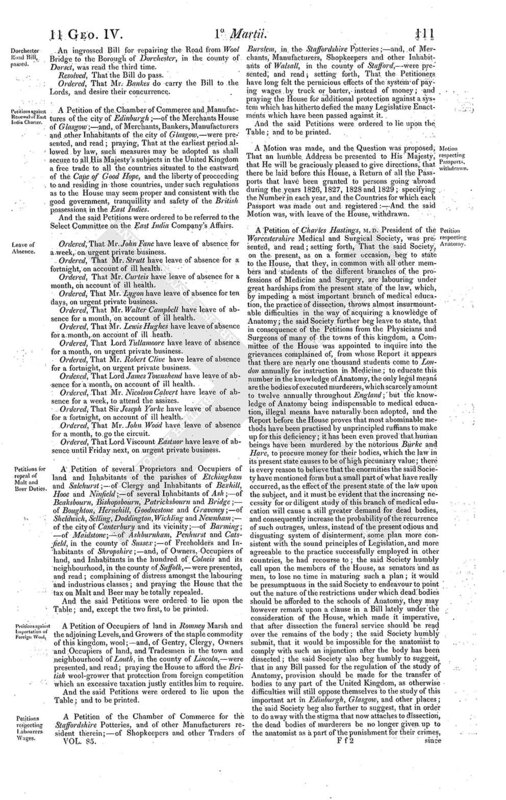 The House, according to Order, proceeded to take into further consideration the Report from the Committee of the whole House, on the Bill for consolidating and amending the Laws relating to Property belonging to infants, femes covert, idiots, lunatics, and persons of unsound mind; and the Amendments made by the Committee to the Bill, being read a second time, were agreed to by the House. The House, according to Order, proceeded to take into further consideration the Report from the Committee of the whole House, on the Bill for consolidating and amending the Laws for facilitating the Payment of Debts out of Real Estate; and the Amendments made by the Committee to the Bill, being read a second time, were agreed to by the House. The House, according to Order, proceeded to take into further consideration the Report from the Committee of the whole House, on the Bill for altering and amending the Law regarding Commitments by Courts of Equity for Contempts, and the taking Bills pro Confesso; and the Amendments made by the Committee to the Bill, being read a second time, were agreed to by the House. Mr. Speaker reported to the House the names of the Members who did not appear upon Friday last when their names were called, on the appointment of the Select Committee for trying and determining the merits of the Petition complaining of an undue Election and Return for the city of Cork. And the names of the said Members being read by Mr. Speaker to the House. Ordered, That Lord Apsley, Andrew Arcedeckne, Esquire, Lord Ashley, Matthias Attwood, David Barclay, Esquires, Lord Viscount Belgrave, James Brougham, Henry Frederick Compton Cavendish, Esquires, Sir Charles Cockerell, Baronet, Arthur Howe Holdsworth, Thomas Read Kemp, Esquires, the Honourable Robert King (of Roscommon), William Leake, James Lindsay, Edward Lombe, George Lucy, Colin Macaulay, Esquires, the Right honourable Sir James Mackintosh, Baronet, Thomas Potter Macqueen, Augustus John O'Neill, Esquires, Lord Francis Godolphin Osborne, Sir Lawrence Vaughan Palk, Baronet, Charles Fyshe Palmer, Esquire, the Honourable William Francis Spencer Ponsonby, Pryse Pryse, Esquire, the Right honourable Sir William Rae, Baronet, John Charles Ramsden, Gustavus Rochfort, Esquires, Lord William Russell, Richard Wogan Talbot, Esquire, Lord Henry Frederick Thynne, Lord John Thynne, Lord William Thynne, Edward Rose Tunno, James Wemyss, Esquires; Sir Charles Wetherell, Robert Williams and Edmond Wodehouse, Esquires, do attend at the Ballot this day. Ordered, That William Henry Ashhurst, Esquire, and the Earl of Brecknock do attend this House upon Monday next. The House, according to Order, resolved itself into a Committee of the whole House, upon the Bill to repeal the Provisions of certain Acts relating to the Removal of Vagrant and Poor Persons born in the Isles of Jersey and Guernsey, and chargeable to Parishes in England, and to make other Provisions in lieu thereof; and, after some time spent therein, Mr. Speaker resumed the Chair; and Sir Alexander Grant reported from the Committee, That they had gone through the Bill, and made several Amendments thereunto. Ordered, That leave be given to bring in a Bill to enable the Commissioners of the Harbour of Ardglass, in the county of Down, to make Contracts for Works, and to borrow Money for the Improvement of the said Harbour: And that Lord Francis Leveson Gower and Mr. Doherty do prepare, and bring it in. Ordered, That leave be given to bring in a Bill to make Provision, in certain cases, for Deserted and Illegitimate Children in Ireland: And that Lord Francis Leveson Gower and Mr. Doherty do prepare, and bring it in. Ordered, That leave be given to bring in a Bill to consolidate and amend the Laws relative to Jurors and Juries in Ireland: And that Lord Francis Leveson Gower and Mr. Doherty do prepare, and bring it in. Ordered, That leave be given to bring in a Bill to regulate the Office of Sheriffs in Ireland: And that Lord Francis Leveson Gower and Mr. Doherty do prepare, and bring it in. Ordered, That there be laid before this House, a Return of the number of Public Meetings of Commissioners of Bankruptcy which were held in London during each month of the years 1825, 1826, 1827, 1828 and 1829; the same being classed under different heads, according to their nature and purpose. Ordered, That Lord Viscount Ebrington be added to the Committee on Select Vestries. Mr. Benett reported from the Committee on the Bill for repairing the Turnpike Road from the top of Whitesheet Hill to the Wilton Turnpike Road, at or near Barford, in the county of Wilts; That the Standing Orders relative to Turnpike Bills, had been complied with; and that they had examined the allegations of the Bill, and found the same to be true, and had gone through the Bill, and made several Amendments thereunto; and the Amendments were read, and agreed to by the House. And then the House, having continued to sit till half an hour after one of the clock on Tuesday morning, adjourned till this day.